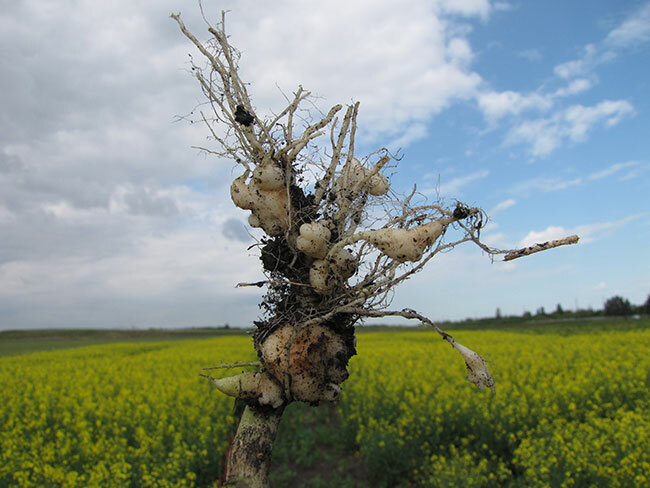 Clubroot continues to be a disease risk to canola crops across Alberta, with more than 2,700 clubroot-infested fields now confirmed, along with a few isolated cases in Saskatchewan and Manitoba. 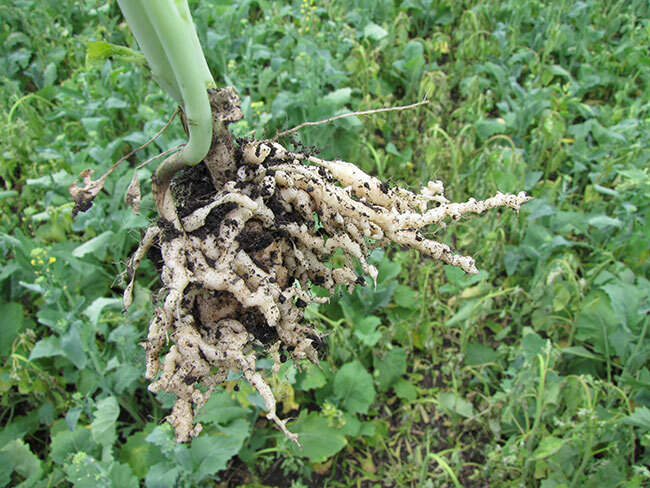 Although good clubroot resistant (CR) varieties have been available for about 10 years, there are an increasing number of fields in Alberta where new strains of the pathogen Plasmodiophora brassicae have overcome the resistance. 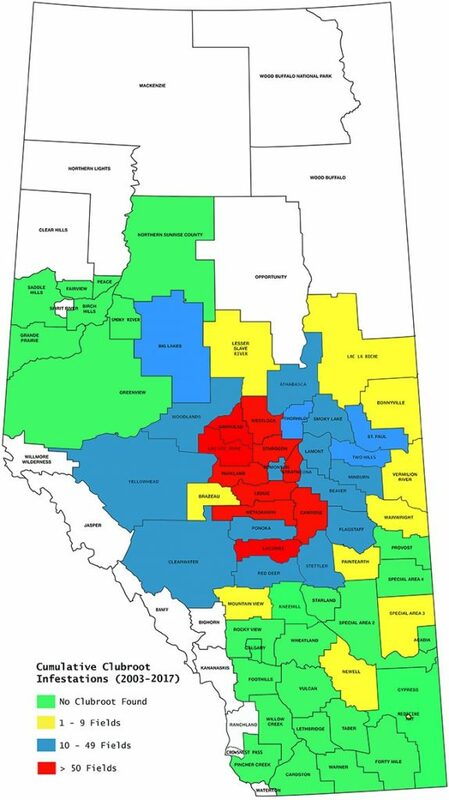 Alberta Clubroot Distribution Map New strains of the pathogen have overcome clubroot resistance. Particularly in fields under short or intensive canola rotations, inoculum levels have been building up. Increasing inoculum levels allow the pathogen to evolve and select for new pathotypes or strains that appear to be highly virulent on all canola cultivars currently on the market. For example, the first of the new resistance-breaking strains of P. brassicae to be identified in Canada was initially classified as pathotype 5 on the existing Williams’ differential set, however this classification did not reflect their virulence on CR canola. Therefore, this new virulent pathotype was called “5X” to distinguish it from the old pathotype 5. However, the term “5X” was soon applied to all strains able to overcome resistance, even after it became clear that not all new strains were alike and some had distinct virulence patterns. This created an urgent need for a new system to identify and distinguish P. brassicae strains and keep up with the emerging new virulence phenotypes that were being identified. Another question is whether pathotypes such as 5X or 3A are really “new” pathotypes or not. “We wanted to know if these pathotypes were here from the beginning and went unnoticed, or did they arise through other mechanisms such as mutation or sexual recombination,” Strelkov explains. “We went back to historical clubroot gall collections of eight Alberta counties from 2005 to 2016 to see if these new pathotypes were present, using recently developed molecular markers. In fact, we found that in quite a few of the galls, these new pathotypes were present at very low levels, lurking in the background and favored by planting susceptible varieties to this new pathotype. The results showed that these pathotypes were usually found at very low levels in galls from non-CR canola. They also confirm that the proliferation of virulent strains resulted from selection pressure imposed by planting CR canola, eventually resulting in pathotype shifts.” In 2017 the analysis was expanded to include a limited number of samples from other regions in Saskatchewan and Manitoba. So far the good news is resistance is holding up in those provinces. Additional samples are being collected in 2018 and will be tested again.